Two Wellington youths, who set out to cross the Tararuas last Thursday morning, have not since been heard of, and their long absence has aroused anxiety for their safety. They are Mr. Allan Bollons, son of Captain Bollons, of Wellington, and Mr. E. J. Kime, of Rongotea, and both are employees of the Post and Telegraph Department. They expected reaching Otaki on Saturday night or Sunday morning, but in view of the amount of snow on the ranges, it is considered that they may have taken shelter in the Mt. Alpha hut, and remained there. Mr Vosseler, the chief guide of the Tararua Tramping Club, has organised two search parties to go over the range from each side, and the parties left the city this morning. The year of 1922 was probably a turning point for how the Tararua Range was seen and treated by people in outdoor recreation circles. At a time when best practices for visiting the back-country were in a comparative infancy, two serious accidents, first in January and then in June, were a catalyst for improving tracks and the building of a new hut on the Tararuas’ Southern Crossing route. having been built during the 1970s. Tellings of both accidents are given through Chris MacLean’s history of the Tararuas titled Tararua: the story of a mountain range, to which I often refer on this blog because I think it’s such a great book. It was only when searching for more information after a query that I noticed the National Library has very recently added another 30 years of issues of The Evening Post to its public online and searchable archive called Papers Past. This makes it easier to view another perspective through the Evening Post as things unfolded. It also reveals additional information that isn’t widely circulated, especially around Alan Bollons’ side of the story as was related through interviews in the Evening Post, which I wasn’t very aware of until now. Below, I’ve reproduced a batch of newspaper articles about the search for Esmond Kime as it occurred, and some of the consequences that eventually led to the improvements of tracks and hut facilities along the Tararua Southern Crossing route. Thanks to the National Library for resourcing the Papers Past service and making this possible, and thanks to Ms Hamilton nee Bollons for starting the discussion that led to me coming across this. I’ve found reading the whole lot really fascinating. In the January 1922 tragedy, Harold Freeman died during one of the Tararua Tramping Club’s early expeditions over the Southern Crossing. It was put down to heart failure, although an unanticipated storm almost certainly contributed, as did the lack at the time of what’s now considered basic safety equipment. There was no practical kind of waterproof raincoat, for instance. Within a few months of Mr Freeman’s death in January, urgent work began on a new hut between Mount Hector and Field Peak, which became known as the Hector Dogbox. Its completion was not in time to have made a difference for Esmond Kime, who died in June of 1922 when he and Alan Bollons were attempting to cross the range from the other side, eventually (and unsuccessfully) needing to turn back to Alpha Hut when conditions worsened. When the Hector Dogbox blew away in a gale in 1928, it was replaced with a more sturdy Kime Memorial Hut. Today, Kime Hut is sometimes referred to as a refrigerator. During the winter of 2009, a friend of mine measured the overnight indoor temperature to be just 1 degree celsius warmer than the outdoor temperature. He used a bivy bag for extra warmth. It keeps the storms out, though, and undoubtedly its presence over the years has both saved lives and allowed for opportunities that would otherwise not have existed. Kime Hut has been replaced twice (if counting the Hector Dogbox), and (I think) it’s on a list of huts to be replaced again in a few years when funding allows. The surrounding area still has potential to be lethal, however. As recently as a year ago, two ill-prepared people died in a blizzard on Bridge Peak, not far from Kime Hut, having made a decision to continue with their original plan (post 1, post 2). Mr Kime’s death in 1922 is a sometimes-repeated story among people who frequent the Tararuas, albeit often told partially or inaccurately. Even if his name or the full details aren’t known, the story of surviving for five days in the tussock, becoming hypothermic and frostbitten but still being responsive and concerned about others when found, then only to die after being given a brandy mixture by rescuers, has become a story that resonates. The brandy mixture and the rapid warming in front of the fire once he was brought back to Alpha Hut both probably contributed to his sudden apparently inexplicable death about an hour after arriving there. The rescuers can’t be and weren’t blamed, because appropriate treatment of such conditions was not well understood at the time. I’ve fixed OCR errors of the newspapers’ text, but I’ve also tried to leave any spelling or typing errors intact as from the original publications. I think I have all of the most relevant articles, but if you notice any extras then please let me know. One of the search parties which went out to look for the two missing youths, Bollons and Kime, lost on the Tararua Ranges since Saturday on the way from Greytown to Otaki, has found Bollons, safe and sound, sheltering in the Alpha hut. He has been brought to Greytown, where he is quite all right. He states that he and Kime parted in the fog on Saturday morning. He did not see Kime again. The search party is now scouring the ranges in quest of Kime, and is expected to report later in the day. No news of the young man, E. J. Kime, who is believed to be lost on the Tararua Ranges, had been received up to time of going to press. Search parties are scouring the ranges, an additional party going out from Kaitoke to-day. As reported in The Post yesterday, Alan Bollons, a son of Captain Bollons, was rescued late on Tuesday night, and was brought back to his home in Wellington yesterday. He had left Kime on Saturday, the intention being that he would return to the Alpha hut and his companion would follow on, as the conditions were too unfavourable to make for Otaki. After that he lost his way, and did not reach the hut until two days later. He had not seen any trace of Kime. “For about an hour we kept on the return track together. We were feeling somewhat exhausted, and decided to reduce our packs, which we did, only retaining the food and blankets. After proceeding a little farther, Kime, who is a good stayer but not a fast walker, wanted me to go on ahead and get help. I refused to leave him for a time, but a little while later I agreed to cut along to the Alpha hut and get a fire going while he followed on. He had his top coat and the food, and I had the blankets in my pack.” In the thick fog the young man Bollons missed the right track, and then decided to continue to the bottom of the valley until he struck the river. It was then late, and, rolled up in his blankets, he remained by the river-side for the night. Next morning (Sunday) he followed the course of the river for three or four hours, but his passage was blocked, and he was forced to turn back. Reaching the spot from which he had set out that morning, he settled down there for another night. He was practically without food, having left the main supplies with Kime. A little milk, bovril, and brandy was all that he possessed. The fog was still thick on Monday, but he decided to endeavour to get back on the track again. After pushing through three or four hundred feet of thick bush, he reached the track at noon, and made his way back to the Alpha hut. There he found no trace of Kime. Foot-sore and exhausted, he remained at the hut during Monday night, being then without blankets, which were discarded owing to the hard work of climbing through the bush. At 9 a.m. on Tuesday Bollons set out for the Tauherenikau hut, which he reached, after a very slow walk, in the evening. Emergency rations were available at that hut, and after a meal the young man wrapped himself in an old sail-cloth and got into a bunk. The rescue party, including Messrs. Vosseler and Wilson, arrived on the scene at 11.40 p.m., and thereafter the young tramper was well cared for. Two of the party remained with him and the others went off in search of Kime. Bollons was brought back to his home yesterday. “I think I should have been dead if the search party had been delayed for another day,” he remarked, after giving details of his ordeal. CARTERTON, 15th June. A special message to the Daily News to-night states that Mr. Maxton, secretary of the Tourist-Track Committee, reports that Consable Gregor and Mr. Allen left Greytown to-day to send help to the search parties. Ten minutes later a wire was received from Mr. I. I. Gregor by the Telegraph Office, Wellington, stating that the searchers were very short of food. The secretary of the Mount Hector Track Committee at once despatched a good supply of bread, butter, tinned meat, sugar, etc., in charge of Messrs. F. Brooks and W. Day, and it is expected that these will reach Bassett’s hut to-night, and Tauherenikau hut to-morrow. NEAR SPOT WHERE LEFT A WEEK AGO. Information was received shortly after noon by the Post and Telegraph Department from the search parties on the Tararuas that the missing tramper E. J. Kime, lost since Saturday last, had been found alive and conscious, sheltering under a rock near the spot where his mate Bollons parted with him on Saturday morning last. The place was on the westward side of Alpha hut, on the way to Mount Hector. From the scanty information available at the time of writing, it appears that the missing man very wisely decided, under the circumstances, to stay where he was in the hope of being found. He was reported to be in a better condition than Bollons was when he was found in the Tauherenikau hut late on Tuesday night, insensible through hardship and privation. Kime was found yesterday and was carried to the Alpha hut, which was reached last night. Further news is expected any time. Later information was received from Mr A. A. McGregor, of the Telegraph Department, with the search party, that Kime was found at 10.30 yesterday morning, at a spot about two hours along the track from Alpha hut, but slightly away from the track. The party hopes to get Kime to Greytown by noon tomorrow. A message from Carterton states: Kime was found yesterday afternoon by Mr. F. W. Vosseller within twenty minutes of the top of Mount Hector, alive and well, considering his privation and exposure. He was on the sunny side of the mountain, in the locality known as Bee Hives. He had plenty of food, but no blankets or coverings except his ordinary clothes, and was brought into Greytown by Messrs. G. B. Brown and Vosseller, and Kime spent the night at the Alpha Hut. They will reach Woodville to-day by the train for Wellington. The joy of the search party in discovering E. J. Kime alive on Mount Hector after he had suffered severe privations since Saturday last was shared by the people of Wellington, and it was with great disappointment that news of his subsequent death was received in the city. It was first of all reported that Kime was well, and everybody marvelled that it should be so. Later reports showed that when Kime was reached by the search party he was in a dreadful condition, suffering severely from frost bite on his legs and arms and, generally, showing the effects of his lonely wait in the mountains in rigorously cold weather. Although everything possible was done for the young man, he died six hours, after he had been rescued. Although he was scarcely conscious he inquired after his mate, Mr. Alan Bollons, and was pleased to hear that Bollons was safe. Bollons, he said, had only left him after he had pleaded that that was the best course. According to Mr. F. W. Vosseler, who led the search party, Kime was found lying in a shallow gully on the sunny side of the range. At daylight on Thursday the whole party spread out in the vicinity of the spot where the two men parted. An hour or two afterwards they followed Bollons’s track down the wrong spur, believing it possible that Kime might have made the same mistake. The search continued after the return, and a little later Mr. Vosseler thought ho saw a man lying in a hollow some distance from the track, and it proved to be Kime, who was in a very bad way. A member of the party was immediately dispatched to Woodside for medical assistance. The party took off their warm clothing, stripped Kime, and replaced his underclothing. Everything was done to infuse warmth in him. He was given brandy and beaten up egg, hot cocoa was administered, and massage was applied to his legs and arms, which were dreadfully frostbitten. He was conscious, but partly delirious, and had some difficulty in articulating. They continued the massage for an hour and a-half, until ho seemed to improve, and then they started to carry him to the Alpha hut. Kime was carried for three hours through snow and ice, and it was seen during the course of the journey that his condition was serious. He seemed to revive after stimulants had been administered, but the improvement was not maintained, and shortly after the arrival at the hut he expired. All the party suffered great disappointment at the tragic ending of their successful search under most trying circumstances. A start was made yesterday morning to carry the body down the ranges. The party was met by Constable Gregor, and subsequently proceeded to Greytown. The members of the search party were Messrs. G. Brown, Scadden, White, Gibbs, and Vosseler, who operated from the Wairarapa side, and Messrs. Cross, Fyfe, Cannon, Mclntosh, and another, who worked over from Otaki. The deceased had been for six years in the Post and Telegraph workshops, and was exceedingly popular. His remains were brought to Wellington by motorcar this afternoon, and it is likely that the inquest will be held here. His funeral will take place to-morrow. The safe working of a mountain track like that which crosses the Tararuas from Greytown to Otaki, and on which two fatalities have occurred within a few months, requires : (1) reasonable accommodation in the Way of huts and bridges, together with the proper stocking of huts, and respect for their stocks by trampers; (2) reasonable self-protection on the part of trampers, who are expected to provide themselves with means of avoiding getting lost, and with safety equipment to enable them to “hold out” when lost. In stipulating- “means of avoiding getting lost,” we refer not only to such desirable things as compass and map, knowledge of their use, “bush” experience, etc. ; We refer also to ordinary weather-sense, and to the common-sense that enables a person to remain in safety if the weather prospect on ths difficult middle section of the track is doubtful. If a tramper neglects to provide himself with clothing and boots suitable to the season and the conditions, if he fails to carry matches in a waterproof container, or if he sacrifices sufficiency of food or equipment for the sake of speed (which represents more or less a gamble on the weather), he is guilty of a negligence that may cost him dear. For that reason, any tendency to make a Marathon race of the Tararua track is to be discouraged. A speed fiend who subordinates his load to his time-record is under temptation to leave the hut stocks poorer instead of better than they were when he reached the hut; whereas the reverse should be the case. But any contributory negligence by inconsiderate or inexperienced trampers —whether minor negligence or major negligence—does not justify a failure to provide reasonable accommodation. Proper bridges and properly built and properly stocked huts should be provided for the use of trampers who operate on safe lines and for the succour of those who, from inexperience or other cause, do not operate on safe lines. As we do not wish to pre-judge in any way the issues at the inquest to be held on the late Mr. Kime, we will not attempt, to reinforce our argument by reference to any of the circumstances of his death. It is not necessary to do so, because the preceding death on the Tararuas—when Mr. Freeman lost his life—is an instance of what may happen, even on a well-organised trip, in the absence of a hut on the gap between Alpha and Te Moi; and instances of insufficiency of equipment—fortunately not ending in death—have been frequent. The principal point that we desire to emphasise is that those best qualified to judge hold that Mr. Freeman would not have died if there had been a hut somewhere in the vicinity of Hector; and it is perfectly certain that the safety of travellers—whether lost or not lost, whether badly equipped er well equipped—would, be greatly increased if the proposal of Mr. Frank Wall to build a Hector hut —for which he himself offered £100 —had been acted on years ago. It is, however, a Case of “better late than never”; and as the Tararua Clubs of Wellington and Otaki estimate that a suitable hut could be delivered at Otaki railway station, in sections, for less than £100, and as these clubs are prepared to undertake the responsibility of transporting the sections from the railway station and re-erecting them on the mountain site, the Government will surely be able to meet so moderate an outlay in money or materials or service, and “get the job done.” With this hut erected, and with a bridge over the Tauherenikau, a great advance will have been made at no great cost. It will, of course, still devolve upon trampers themselves to use prudence in their own interest; and a continued lack of self-protection, or a tendency to abuse the huts and their stores, would certainly strengthen the demand for a closing of the track except to those holding Government permits. To a certain extent, trampers have their salvation in their own hands-. A mail who removes a bottle of matches from one of these huts, or who uses the contents to smoke his pipe, and fails to replace them in waterproof condition, is a potential murderer. An inquest regarding the death of the young man, Esmond James Kime, the victim of the Tararua tragedy, was opened by the Coroner (Mr. F. K. Hunt, S.M. ), on Saturday. After formal evidence of identification, and the testimony of a constable had been taken, the hearing was adjourned sine die, pending the recovery of Bollons, who will give evidence. The funeral of the late Mr. C. J. Kime, who died shortly after his rescue in the Tararua Ranges, took place yesterday, and was very largely attended. The interment was made at Karori, Mr C. W. Winter officiating at the graveside. The staff of the Post and Telegraph Workshops, where deceased was employed, were well represented. Mr. F. W. Vosseler and other members of the search party and Captain Bollons were among those who attended. A large number of beautiful wreaths were laid on the grave. MR. and MRS. KIME and Family wish to thank; the donors of the lovely wreaths, the senders of messages of condolence, and all who in any way showed sympathy with them in their recent tragic bereavement. Words fail to express their gratitude to Messrs. McGregor, Vosseler, and those who so heroically tried to save the life of Esmond James Kime, lost on the Tararuas while journeying with his friend, Alan Bollons. Recognition of the services of Mr F. W. Vosseler as leader of the search party which rescued Mr. Alan A. Bollons and the late Mr. Edward J. Kime on the Tararua Range, was made yesterday afternoon by members of the Wellington Commercial Travellers Association. Mr. A. C. Croll, who presided over a large gathering of members, handed Mr. Vosseler a medallion, which bears on one side his initials, and on the other an inscription stating that the medallion was presented to him by the members of the Commercial Travellers’ Club in recognition of the heroic rescue he had helped to achieve. Messrs. R. M. Brewer (past president) and Mr. R. Wilson (vice-president) also made very, eulogistic references to the work of the rescue party. In his reply, Mr. Vosseler said the greater part of the credit was, due to his colleagues, but for whose pluck and endurance, he said, the rescue could never have been effected. He also paid a tribute to the Otaki search party. Under the heading of “Track Improvements,” the annual report of the Tararua Tramping Club, to be presented at the annual meeting this evening, states: — “Through a generous donation of our president, Mr. W. H. Field, the track leading from Greig’s farm at Reikorangi to Mt. Kapakapanui has been greatly improved. The club, under the direction of Mr. D. R. Hoggard, has with very little expenditure of funds erected two huts on the saddle between Dobson’s Mistake and Mount Marchant. A good track has also been cut through the dense secondary growth approaching this point. “For some time past Parliament has authorised the expenditure of sufficient funds to enable the erection of a central hut near Mt. Hector and a suspension bridge over the Tauherenikau River. Unfortunately, the Minister of Public Works has been unable to see his way to authorise the work to proceed. The material for the suspension bridge was purchased some time ago, and is in the hands of the Public Works overseer at Greytown. The cost of constructing the bridge would be small. It is probable that neither Mr. Freeman nor Mr. Kime (who lost their lives on the Tararuas) would have died had the central hut been erected. It would cost less than £100 to deliver at Otaki Railway Station (a hut built in sections), and the Otaki Club and this club have undertaken to see to the transport of such hut from Otaki to the site near Mt. Hector and its erection on such site. It is to be hoped that the Minister of Public Works will now reconsider the matter. In connection with the winter camp at National Park, Whakapapa College has been booked from 27th August to 5th September. The Tararua Tramping Club, which held its annual meeting last evening, has succeeded in its main purpose, the popularising of tramping trips, short and long. By means of co-operation and organisation, the club members are able to help themselves and one another to outings and explorations that would hardly be possible if the matter, were left to unorganised individual initiative, and which would not be possible at all to some of the older and the younger members of the institution. The club’s organisation secures the best opportunities at the lowest cost, and on the safest lines. A secondary purpose, to be developed in process of time, is the gathering of funds for the improvement of tracks and track-directions and accommodation in the wilderness. During last financial year the club’s membership, though increasing, yielded only £67 in subscriptions, so there is not much left, after paying tramping expenses, to devote to track subsidies. But the President of the club, Mr. W. H. Field, M.P., donated £10 to the Mount Kapakapanui track; and, with increasing popular support, the club may be able to find more money for similar purposes. Meanwhile, its members have been giving of their labour, and, under the direction of Mr. D. E. Hoggard, have greatly improved the Mount Marchant track in the vicinity of Dobson’s Mistake, and have erected two shelters at very little expense. This represents real public service. Mount Marchant route junctions with the Greytpwn-Otaki trans-Tararua track at a point on the Grey town side of Hell’s Gate, and does not offer such a direct track from Kaitoke to Alpha hut as is offered by The Quoin. But a Mount Marchant track avoids the ford over the Eastern Hutt and also the ford over the Tauherenikau, and offers a river-free retreat, in bad weather, from the Alpha hut to Messrs. Phillips Brothers’ farm. The efforts of members of the club to improve the Kaitoke angle of approach to the Tararua peaks have not obscured the club’s view of the importance of improvements to the existing trans-Tararua track referred to above. Although its terminals are in Otaki and the Wairarapa, and not on the Wellington side of the hills, the necessity of concentration on the improvement of this track is admitted. Two prime needs are a hut near Hector and a. Tauherenikau bridge, and the club considers the hut the more important. There seems to be no financial difficulty, for it was announced at the club’s meeting last evening that the Government has promised £ for £ subsidy up to £100, that the relatives of the late Mr. Kime’ (who died at Alpha after being rescued) have offered £50, and the Girdlestone Memorial Committee has offered £25. In addition, one member last evening made a special donation, and said he knew of others to come; and although some members appear to be adverse to making a specific appeal for money outside the club’s own membership, we gather from the President’s remarks that the club would gladly receive from anyone, whether a member or not, financial assistance towards tracking the Tararuas, which is a purpose public in scope and national in character. A time when public attention has been aroused by recent fatalities, and when the creation of safeguards is in the public mind, is a suitable time for donations, and’it would surely be quite in order if the club acted as a focus for them. The work done by the club’s search party, headed by the Chief Guide, in rescuing the two lost men alive — although one of them unfortunately died a few hours later — is work that is beyond praise. This deed has done more than columns of words to show the public that the Tararua Club has in its ranks men who can rise to any occasion, and that the club is a worthy trustee of funds provided for the improvement of the mountain tracks in the general interest. The pleas put in last evening for forest preservation and for the transference of bush scenic reserves from the Lands Department to the Forest Service are in direct accord with the principles advocated in these columns. We hope that Mr. Field’s remarks on the subject will be repeated, with equal or greater emphasis, in the House of Representatives. TARARUA CLUB PLEADS FOR FORESTS AND TRACKS. The need of a central hut on the trans-Tararua route, and of a bridge over the Tauherenikau River, was the principal theme in the annual report (published yesterday), submitted to the annual meeting of members of the Tararua Tramping Club, held last evening. The President, Mr. W. H. Field, emphasised the value of a central hut as a life-saving agency, and referred to the deaths of Messrs, Freeman and Kime, which would probably not have occurred if there had been a central hut. The president advocated, in addition to the hut and the bridge, the marking of the track. He said that the Government had authorised £1 for £1 subsidy, up to £100, for track improvement. He endorsed the advice of the club’s chief guide, Mr. Vosseler, that trans-Tararua parties should number not less than three members, one of whom should know the track. Persons who removed water-proof matches from the huts, who used the firewood without replacing it, or who abused the food supplies, were potential murderers. The relatives of the late Mr. Kime had stated their intention of placing in the club’s hands £50 for improving the track, and the Girdlestone Memorial Committee proposed to give £35 for the purpose, suggesting at the same time that the name of the late Mr. Girdlestone should be used in naming the new hut, or in some suitable nomenclature. Mr. D. R. Hoggard mentioned Mr. Field’s own gift of £10 for the improvement of the Mount Kapakapanui track. He advocated the construction of a track from Kaitoke via Mt. Marchant to a point on the present trans-Tararua track near Omega; and he looked forward to the time when a track would run from Alpha to the Manawatu Gorge. Mr. Vosseler stated that, in the vicinity of the Tongariro National Park, bush that should be preserved was being cut down. The same thing had happened and was happening on the Wanganui River and in the Marlborough Sounds. The club should protest against the planting of the exotic heather in the Tongariro National Park. Exotics should not be permitted in native bush parks and reserves. Dr. Wilkins referred to the value of tramping as a builder of physique and of character, and as inculcating a love of Nature. The mountains of a country were symbolic of the ancient and the sublime. After Mrs. Bacchus and Mr. Wiren had spoken in support of the club’s activities, the president stated, in answer to Mr. Wiren, that the question of establishing club houses was being considered. It was partly a financial question. As to opposing the damage that was being done in the National Park neighbourhood, more could be done if trees had votes. Unfortunately, while Governments talked of protecting native birds, they permitted the destruction of the trees, that provided the birds’ food supply. Some of the scenic reserves that had been established on the Main Trunk line had been quite destroyed. The Lands Department had allowed things to “go hang,” and had allowed cutting and stock-grazing that led to destruction. These scenic reserves should be transferred to the Forest Service. Scenic reserves were not the property of this generation. On the motion of Mr. Vosseler, seconded by Mr. Hoggard, Mr. Field was elected an honorary life member of the club, in consideration of his services to the club and to scenery preservation and forest protection. Mr. Field was also re-elected president of the club. The following other officers were elected : — Vice-presidents, Messrs. H. F. Yon Haast, D. R. Hoggard, I. C. Thomas, and W. H. Wilson; chief guide, Mr. F. W. Vosseler; hon. secretary and treasurer, Mr. A. N. Smith; committee, Professor Boyd Wilson, Dr. Wilkins, and Messrs. L. B. Cross, J. H. Gibbs, H. C. Milne. G. B. Brown, A. C. Gifford, A. Wiren,. Edmonds, George Phillips, A. J. Conchman. and I. H. Jerram; auditor, Mr. R. C. Boss; official photographer, Mr. Milne. A member suggested that the club invite subscriptions for track improvement. He donated a sum. The president said that the club would gladly accept money for the purpose, but would not make any, specific appeal outside its own members. Suggestions for the improvement of the Tararua track were made by the Coroner (Mr. F. K. Hunt, S.M.) yesterday afternoon, when he gave his finding at the inquest regarding the death of Edmund James Kime, 24 years of age, who died at the Alpha Hut on 15th June from exposure, following on his experiences in a mountain storm. After, expressing his appreciation of the work of the rescue party, which was led by Mr. F. W. Vosseler, the Coroner added a rider expressing the opinion that there should be a greater number of sign-posts on ihe track, that an additional hut should be erected between Mount Hector and Mount Field, and that a footbridge should be put across the Tauherenikau River. The inquest was conducted for the police by Sergeant J. J. Power. Allan A. Bollons, a clerk in the P. and T. Department, said on Thursday, 8th, June, he accompanied the deceased on a tramping expedition across the Tararuas. On Friday night they camped at the Alpha Hut, and the following morning left for Mount Hector, carrying blankets, cooking utensils, food, etc. They intended to complete the journey to Otaki that day, but about 11 a.m. they found themselves in a position of which they were not sure. There was a fog and a strong south-easterly wind prevailing, and witness and the deceased turned back in the direction of the Alpha Hut. Kime was slightly tired when they decided to turn back and reduced his pack. They walked for an hour and a half, when the deceased asked witness to go for assistance, as he was breaking down. Witness then left Kime, and went on ahead, but about an hour after witness lost the track. On Sunday he tried to find his way out, but the mist was too heavy, and he had to spend the day by the creek. On Monday afternoon he got back to the Alpha Hut, and he was found the next morning very much exhausted. Frederick William Vosseler, manager of Billiards, Ltd., said he organised a search party on 13th June. Witness was with the Wairarapa party, which left Woodside about 7 o’clock on Tuesday night, and arrived the same night at the Tauherenikau Hut, where Bollons was found in an exhausted condition. The deceased was found on Thursday some miles along the track from the Alpha Hut, where he died about 7 o’clock that same- night. Witness expressed the opinion that there should be more direction posts on the tracks and an additional hut between Mount Hector and Mount Field. A party setting out over the Tararuas should consist of three men at least, and should be properly equipped and have a knowledge of the locality. Witness also suggested that it would be a good idea to have the sign-posts connected by wire, as this would be a great help in fogs. Witness added that Kime had stated that Bollons had done everything possible for him. In returning a finding of death from exposure, the Coroner said he did not think he would be doing his duty if he did not convey the thanks of the public to Mr. Vosseler and the members of the’ rescue party. If it had not been for the work of that party there probably would have been a double tragedy. Mr Hunt then added the rider as given above. The inquest on the death of the late Mr. Kime resulted in recommendations by the Coroner that the local authority should sign-post the trans-Tararua track, erect a hut between Mount Hector and Mount Field, and put a foot-bridge over the Tauherenikau River. The order of importance would seem to be: hut, bridge, track-directions, but it cannot be said that the bridge is less necessary than the hut, and it is to be hoped that, by the goodwill and co-operation of the Government and the ” local authority” and the unpaid workers, real work will start as soon as the weather permits. It would seem that the Government proposes to put on the Estimates a £ for £ subsidy, up to £100, for hut, bridge, and track improvements; and as it has been announced that £50 is available from Mr. Kime’s estate and £25 from the Girdlestone Memorial Fund, the financial prospect appears to be good. Probably it has been good—so far as this purpose is concerned—at any time during the last several years, but public action is at all times liable to be attacked with a paralysis peculiar to itself, a paralysis so effective that even the individual donation of £100 for the purposes of a Hector hut failed to get anything done. Recent events, however, have produced a fairly deep impression, out of which, at last, action may arise. On the subject of mountaineering and mountain tracks, some extreme views are held. On the one hand, it is argued that mountaineering and tramping are meant to be strenuous, wherefore conveniences are out of place; on the other hand, some people would like to put a motor road over Alpha and Hector. There is, we think, a point of balance between the extremes. If the thing to be aimed at is mountaineering pure and simple, and the preservation of all Nature’s disadvantages as well as her advantages, then why construct any hut or tracks at all? The more reasonable course, we think, is to construct arterial tracks (such as the trans-Tararua track) of such a standard of quality and accommodation that they may be travelled over in safety not only by the young, strong, and skilled, but also by people who require easy tramping stages with sufficient shelter and track-guidance. There are many people who would like to go over the Tararua track, who would be benefited by it, and who deserve its benefits, but they will not go until the present degree of risk is reduced. We think that they are entitled to ask that their point of view be considered, and we think that improvements in the way of huts, bridges, and track-directions should be extended, along the lines recommended by the Coroner, until the track offers a safe tramp for many, not merely for a few. The existence of arterial tracks will not prevent anyone from leaving them at will to enjoy the untrammelled mountain-side, and to take what risks he likes. The aim is not to abolish voluntary risks, but to reduce involuntary ones. As regards the latter, there is a public responsibility. The other risks belong to the individual himself. KIME.—In memory, of Esmond James Kime, who departed this life on the 15th June, 1922. Ever remembered. Inserted by his friends, A. S. and L.
KIME.—In loving memory of Esmond James (Jim) Kime, who died in Alpha Hut on Mount Hector on the 15th June, 1922. Absent from the body, present with the Lord. Inserted by his Bible Class friends. KIME.—In affectionate memory of Esmond James Kime, who died on the Tararua Ranges, l5th June, 1922. Inserted by R. J. F. aud I. J. P.
During the past year the Tararua Tramping Club has carried out several track improvements, and it is hoped in the near future, with Government assistance, to still further improve them. 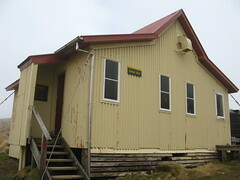 Dealing with this aspect of its affairs, the club, in its annual report, states: “As mentioned in the last annual report, the committee was greatly impressed with the necessity of providing some sort of shelter on the exposed portion of the Tararua track between the Alpha Hut and Table Top, and to remedy this defect, until an adequate sum of money was available for the erection of the proposed central hut, we obtained material and with the assistance of members of the club and others interested in the track, had this packed to the site near Mount Hector, and just prior to last Christmas were enabled to have a small emergency hut erected there. Subsequent to the last’ annual meeting, donations amounting to £86 16s (including amounts of £50 from Mr E. J. Kime and £25 from the trustees of the Girdlestone Memorial Fund) were received by the club for the purpose of erecting a memorial hut on the above site, but now that the gap has been filled temporarily this sum is being held in trust and will be utilised for the purpose for which it was donated as 800p as a sufficient amount in the shape of a Government grant or otherwise is available. In the meantime, the Grey town Track Committee has received a grant of £50 towards the cost of the Tauherenikau bridge and £65 towards track improvements on the Greytown side, both amounts being granted on the £ for £ basis. In response to urgent requests from them the committee decided to assist them with the bridge to the extent of £25, and they have now made a start with this necessary work which it is hoped to have completed before the spring. This entry was posted in article and tagged article, favourite, history, huts, newspaper clippings, search and rescue, snow, tararua tramping club, tararuas, tramping. Bookmark the permalink.